Dyeing fabric in a washing machine has never been easier! iDye's self-dissolving packet eliminates the handling of messy powders. 30 colors for natural fabrics. Each package dyes 2 to 3 lbs of fabric. 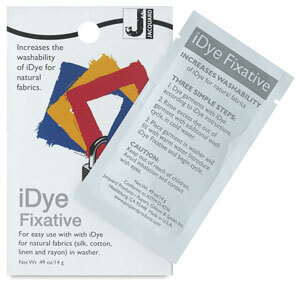 Jacquard iDye Fixative helps retain color intensity over time and reduces the risk of backstaining during laundering. It's ideal for items that are washed frequently or have particularly strong colors.